We hope that the HOKISA Peace House will contribute to much-needed social development in Masiphumelele and towards greater understanding of HIV/AIDS. The meeting hall in this house will serve as a place for HIV/AIDS education and prevention already begun by our youth group and women’s group. 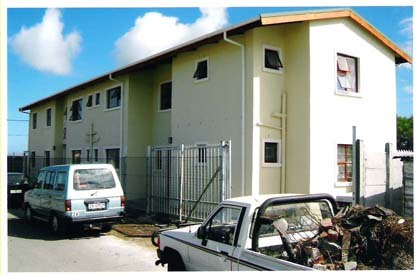 The house further consists of seven apartments for HOKISA team members (who previously lived for too many years in poor shacks) and two apartments which will be given to teenagers or young adults affected by HIV/AIDS who urgently need temporary housing. Until now we were unable to provide this in the HOKISA Children’s Home. We have to thank many people and organisations who helped us to make this dream possible. We undertook extra fundraising for this project as no donations given to the HOKISA Children’s Home have been used for this new house. The HOKISA PEACE House will be run and maintained by its residents and will need no further financial assistance from the HOKISA organisation. 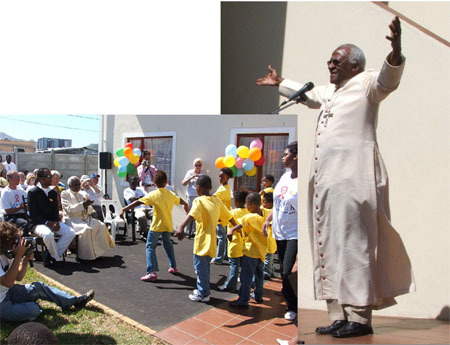 After several months of planning and construction work the building of the second HOKISA Home in Masiphumelele has been completed – the HOKISA PEACE HOUSE was officially opened and blessed on November 18th 2005 by Archbishop em. Desmond M. Tutu. The celebrations started with a ceremony at the Peace House. 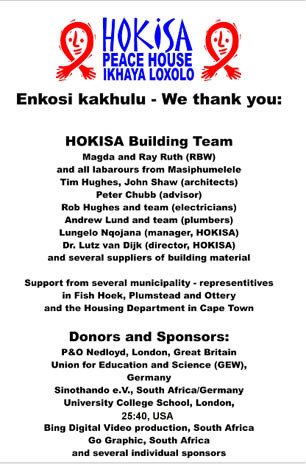 The HOKISA Team and children thanked all friends and supporters who made the dream of the second home possible. The highlight of this celebration was the blessing by Archbishop Desmond Tutu, a patron of HOKISA since its beginning. 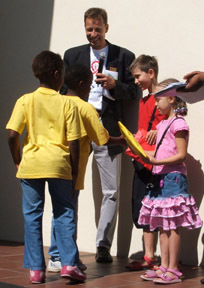 After the ceremony the Archbishop adressed learners from Masiphumelele High and Primary Schools in connection with World AIDS Day 2005. Gratitude to friends, donors and supporters. Sign erected at the entrance to the home expressing HOKISA’s gratitude to friends, donors and supporters.